For those of you who haven’t been paying attention, this weekend marked the end of the Major League Soccer regular season. Going into the weekend, there were still some unanswered playoff questions, including the one about the Supporters’ Shield. After tying last weekend in Los Angeles, Seattle Sounders FC and the L.A. Galaxy met again, this time in front of 57,763 fans at CenturyLink Field, to decide who would get the MLS’ top regular season trophy. In the end, in Landon Donovan‘s final regular season game with the Galaxy, it was the Sounders who proved to be too much, winning 2-0 and taking home the Shield. Here’s how it all went down. Coming into the game, the Sounders needed only to tie LA to remain atop the Western Conference table, and for a while, it looked like that’s what we were going to get. The teams sat at a 0-0 deadlock at the end of the first half, with goal chances few and far between. There were plenty of fireworks, however, as the teams combined for six yellows, and even came to pushy, shovy blows in the 71st minute. You really got the feeling that neither of these teams really wanted the tie. Even the Sounders seemed to want to win the trophy outright with no asterisks or tie breakers involved. I thought it was a fun game. Anyway, it wasn’t until the 85th minute that Seattle finally broke through. Marco Pappa, a 26 year old winger from Guatemala who had subbed in in the 73rd minute, ended up wide open after a quick-start free kick about 35 yards from the goal. MLS MVP candidate Obafemi Martins sent the ball towards him in the penalty area, and Pappa beat keeper Jaime Penedo for the score. After L.A. nearly equalized late, Pappa struck again in the 95th minute. The Galaxy played the ball back to Penedo, who brought it out into the penalty area with his feet. Pappa raced in, disposessed Penedo, dribbled around him and chipped it in for the 2-0 win. The Galaxy wanted a foul call for the dispossesion, but it wouldn’t have mattered anyway, as the game was already decided. 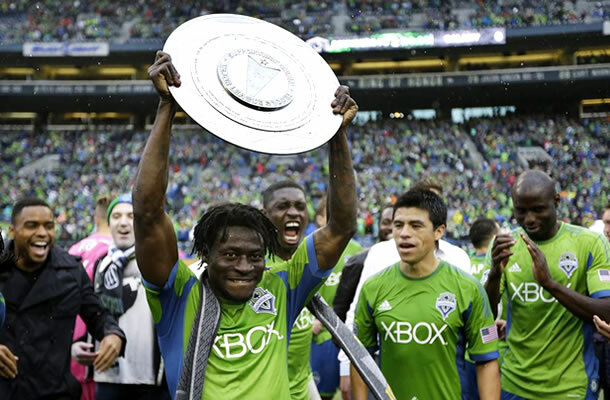 The Sounders became just the second team in MLS history to win both the Supporters’ Shield and the U.S. Open Cup in the same season, and will attempt the triple starting this week in the MLS Cup playoffs. They also set the MLS record for wins in a season with 20. Great year for the Sounders. The Galaxy, meanwhile, still move into the playoffs and, because the Sounders also won the U.S. Open Cup, they’ll end up in the Champions League as well, so that worked out just fine for them. It would have been nice to get the Shield for Landon, though. 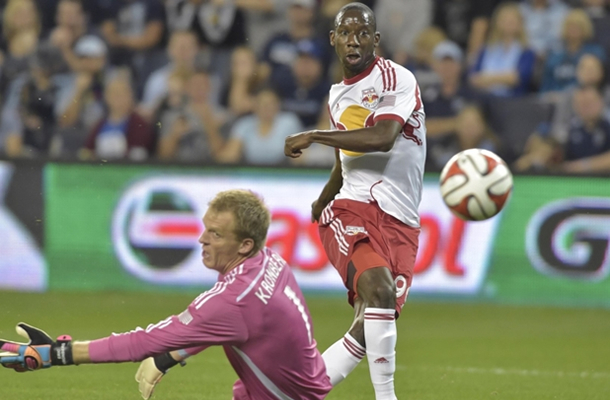 English International Bradley Wright-Phillips of the New York Red Bulls, who has been chasing Roy Lassiter and Chris Wondolowski for the MLS regular season goals record, scored his 26th and 27th goals of the season against Sporting KC on Sunday. The two strikes brought him level with the two record holders, and into the MLS record books. Over the last 20 minutes or so, his teammates did everything they could to set him up for the record breaker, but a great save by Eric Kronberg in the 83rd minute cost the BWP his own spot in the books. To his credit, Wright-Phillips got the ball back on that play and attempted to set up a teammate for a goal instead of shooting again. Either way, congratulations, Bradley. With the 2-0 win, the Red Bulls secured the fourth spot in the Eastern Conference Standings, pushing Sporting KC to the fifth spot in the process. What does that all mean? Not a lot, as the teams would have played each other in the Eastern play-in on Wednesday no matter what. I guess it should help that the game will now be in New York though. On Saturday, the Portland Timbers took care of business with their big 2-0 win over FC Dallas. That meant that the Whitecaps had to beat the Colorado Rapids on Sunday in order to make the playoffs over Portland. Unfortunately for Timbers fans, the Rapids are one of the worst teams in the whole league. The Whitecaps made it interesting, but a 70th minute goal from Costa Rican international Kendall Waston punched their ticket to the Western play-in game against the very same FC Dallas team that almost got them eliminated. Sorry, Timbers. Hope you enjoyed all the action. I’ll be back with some playoff previews in the next couple of days.